Backpacking combines hiking and camping in a single trip. A backpacker hikes into the backcountry to spend one or more nights there, and carries supplies and equipment to satisfy sleeping and eating needs. A backpacker packs all of his or her gear into a backpack. This gear must include food, water, and shelter, or the means to obtain them, but very little else, and often in a more compact and simpler form than one would use for stationary camping. A backpacking trip must include at least one overnight stay in the wilderness (otherwise it is a day hike). Many backpacking trips last just a weekend (one or two nights), but long-distance expeditions may last weeks or months, sometimes aided by planned food and supply drops. Backpacking camps are more spartan than ordinary camps. In areas that experience a regular traffic of backpackers, a hike-in camp might have a fire ring and a small wooden bulletin board with a map and some warning or information signs. Many hike-in camps are no more than level patches of ground without scrub or underbrush. In very remote areas, established camps do not exist at all, and travelers must choose appropriate camps themselves. 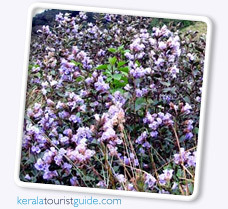 Kurinjimala Sanctuary protects the approximately 32 km� core habitat of the endandered Neelakurinji plant in Kottakamboor and Vattavada villages in Devakulam Taluk, Idukki district of Kerala Neelakurinji is a shrub that used to grow abundantly in the shola grasslands (the origin of Water) of Western Ghats in South India above 1800 metres. The Nilgiris, which literally means the blue mountains, got its name from the purplish blue flowers of Neelakurinji that blossoms gregariously only once in 12 years.